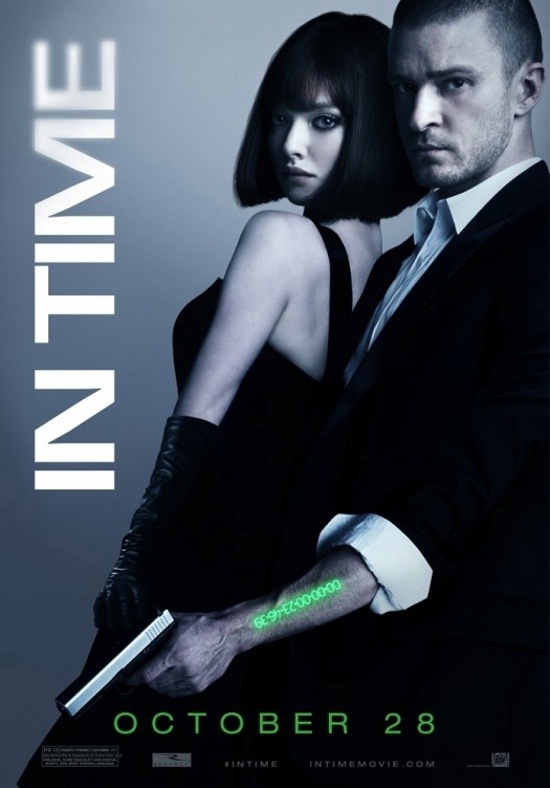 Starring: Justin Timberlake, Amanda Seyfried, Cillian Murphy, Vincent Kartheiser, Olivia Wilde, Johnny Galecki, Alex Pettyfer, Matthew Bomer, Yaya DaCosta, Ethan Peck, Toby Hemingway. Writer/director Andrew Niccol is no stranger to scientific ideas. In 1997 he delivered the Orwellian genetic engineering “Gattaca“. In 2002 he tackled computer generated imagery in “S1mOne“. He also penned the predictory script to reality TV in 1998 with “The Truman Show“. Fantasy and Science Fiction seem to be genres that he’s comfortable with but this is not one of his better efforts. In the not too distant future, people stop ageing when they reach 25. If they are wealthy though, they can buy time. The rest, have to work for it. Lifespan has replaced money in this dystopian world. One of the workers, Will Salas (Justin Timberlake), is gifted time from a suicidal friend, which allows him to escape his poor background and experience the life of the rich. But there are state police, known as “Time keepers” who are out to thwart his new life. The premise to this is quite an intriguing one and the dystopian futuristic setting is wonderfully captured by the Coen brothers’ regular cinematographer Roger Deakins. It’s just a shame that with such a strong base to work from, it becomes nothing more than a chase thriller and abandons any attempt to delve into some possible existential theories. Even as a chase thriller, it lacks any form of excitement. It has it’s moments but ultimately the film takes too long in getting to it’s destination. Time is of the essence for it’s characters and ironically, it also gets taken from us, having to slog through this. I’m not Justin Trousersnake’s biggest fan, but he delivers a decent performance. However, the progression of his character as a future ‘Clyde’ to Seyfried’s ‘Bonnie’ is uneasy and a little hard to take. Cillian Murphy’s ‘Time keeper’ police officer is quite an intriguing one but he has little, to no, backstory. When we are given a glimpse into his character it’s too little too late. It’s this overwhelming feeling of emptiness that, as a whole, the film suffers from. I didn’t go into this film expecting a masterpiece or anything but I still expected more than I got. Despite looking good on the surface, it’s ultimately hollow. Fans of the likes of “The Adjustment Bureau” may find more to savour though. This entry was posted on May 5, 2012 at 11:15 am and is filed under Action, Science Fiction with tags 2011. You can follow any responses to this entry through the RSS 2.0 feed. You can leave a response, or trackback from your own site. I didn’t know this was made by the same guy as S1m0ne. I liked both, but S1m0ne was admittedly better. Yeah, it’s the same dude. My favourite of his films is actually “Lord Of War”. I really liked that and it was a change from his normal Sci-fi roots. Emptiness. You said it. It’s such a shame since I think the writer has talent for sci-fi. The idea and setting was great. But what he made of it… poor. This could have been much better. The idea was great but I think he became a bit lazy with the delivery. Great review, Mark! I liked this film a bit more than you did but I agree that it could’ve been way better given the fantastic concept. Justin Timberlake is a very talented man but his performance here lacked gravitas, and so did Amanda Seyfried’s. Still, there are some exciting scenes, and other very dramatic ones (Wilde’s character dying) and the film looks great. It’s not really bad, but the material deserved a better treatment. I couldn’t agree more. I think the film had more mileage than was shown. I was tempted to rate it slightly higher but couldn’t get over the feelings of frustration it left me with. This is one film where I thought the trailer gave me all the info I needed to know about it. Nice review though, now I know I don’t need to see this one! Yeah, I’d avoid it Andy. You’re not missing very much at all. It could and should have been so much better. YEA totally agree with the review – great concept but poor execusion – big fan of Amanda Seyfried and even she was aweful! Agree this film was a let down. While I liked the premise going in the results were a bit laughable. That seen where Timberlake is running toward his mom (wilde) had me rolling on the floor. Sadly I don’t think that was the intent of the film makers. Alright Adam? How are ye mate? Do you think I’ve been busy? I thought I was slacking. I try to get a new post up every other day. Even if it’s an older film. Sometimes you have to sit through nonsense like this film though. However, I’ve seen a few good ones of late but this one I’d rather forget. , I am finding the worse the film the harder it is to review! It should have been. Great idea badly executed. I actually enjoy reviewing shut film’s. It gives me a chance to rant a bit. I wasn’t as scathing with this as I could have been though. Definitely. It could have been brilliant. It’s a great concept but unfortunately they didn’t invest the time required in the story.